Back in mid January, 2016, the Lumiere Festival came to the Unfinished City and it was something that I had to witness. Spread across four nights there were plenty of opportunities to see all of the installations, as they were spread over four main areas: Mayfair, Piccadilly, Westminster and King's Cross. Various artists transformed the city's streets, buildings, parks and squares into temporary art galleries, where light was the key element. 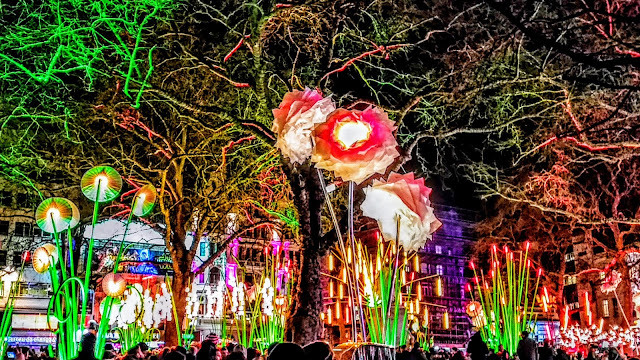 Produced by Artichoke, the Lumiere Festival is a celebration of light that brings together artists from around the globe, who transform public spaces with light. Beginning in Durham, in 2009, the Lumiere Light Festival was meant to be a one-off event. However, such was its success that it has returned to Durham every year since. The Lumiere Festival travelled to Derry-Londonderry, in 2013, before illuminating London, in 2016. The festival is set to return to London from January 18-21, 2018.